A mask is one of the four basic pieces of equipment to purchase when you first begin to dive, along with your snorkel, fins and boots. However, your mask may be your single most important purchase of those four items. That is simply because if you can't see on your dive or you spend all of your time trying to keep your mask free of water, you won't have an enjoyable experience. You may ask first why you just can't use the goggles that you use when swimming laps at the gym. You need a mask that covers your nose as well as your eyes, because exhaling through your nose allows the diver to equalize the air pressure inside the mask for the duration of the dive, preventing "mask squeeze." There are many types of mask, starting with the purge mask that allows you to clear your mask by simply exhaling. There are also low-volume masks that are easy to purge, but these masks have a tendency to limit your peripheral vision. Black silicone masks are popular with cave divers, hunters and photographers who don't wish to be distracted by anything that is not right in front of them, but the most popular masks are the clear silicone masks, some of which even come with side windows for enhanced peripheral vision. 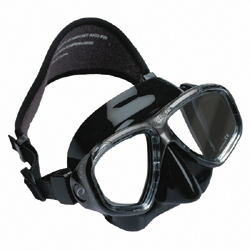 At Dolphin Scuba Center, we offer the full range of masks from which you can chose. If your vision needs correcting above water, we can install corrective lenses in many of our masks. Also, no mask works well unless you invest in some of Dolphin Scuba's mask-cleaning products such as McNett SeaDrops or the very popular 500 PSI. Our masks range in price from the Storm Panoramic Mask all the way up the line to the Oceanic Datamax HUD Wireless Scuba Mask. You are sure to find the perfect mask for your budget!